Interesting lunchtime talk by Alex (Sandy) Pentland about honest signals sponsored by the Program on Networked Governance program at Harvard’s Kennedy School. Sandy’s theory is that 50,000-100,000 years ago, humans lacked language, yet still managed to communicate with each other through “honest signals” (ancient primate signaling efforts which developed biologically to communicate our intentions, our trustworthiness, our suitability as a collaborator, whether we were bluffing, etc.). When language was introduced, it didn’t over-write or eliminate these honest signals but evolved to be synergistic with these signals. While we focus much more on language, these signals are measurable (Sandy’s group developed machines to read these signals) and often equally or more effective at predicting various behaviors than language. Sandy’s research aims to shine a light on this powerful channel that we know less about. Sandy notes that such data from electronic ID badges (sociometers) and specially-programmed smart phones, can give us a “god’s eye” view of how the people in organizations interact, and observe the “rhythms of interaction for everyone in a city”. Sandy’s group at the MIT Media lab focuses on 4 of them, although there are probably others (laughter, yawning, etc.). INTEREST, shown by activity. An autonomic response. For example in children, this is evinced by jumping up and down or in dog’s by barking or wagging tail. ATTENTION, by looking at influence. Evidence of thalmic attention. Sandy observes that people actively following in conversations break in faster than they could with normal attention spans. Shows that they are processing the conversation and discussion as it goes along and predicting the right time to break in. EMPATHY, as shown by mimicry. This is evinced by mirror neurons, which are observable in infants as young as 3 hours old that can imitate a mother sticking her tongue out. People who evince higher levels of mimicry are seen as more empathic and more trustworthy. For example, they had computerized agents trying to sell an unpopular policy to students; in the cases where the computerized agent mimicked the body movements of the experimental subject with a 4 second delay, the computerized agent was 20% more successful in selling the policy to the experimental subject and the subject was unaware that he/she was being mimicked. EXPERTISE, as shown by consistency. This a function of the cerebellar motor. We assume that people who can do things more smoothly are more expert because of the number of actions that need to be simultaneously coordinated. What do these honest signals predict? -Computers attentive to these honest signals (and ignoring the content) were as successful in predicting from pitches by entrepreneurs which business plans would be judged by business school students as successful. -Success in speed dating: monitoring the female’s signals predicted 35% of the variation in which couples exchanged their phone numbers, and this was significantly higher than any other factor researchers could find. Interestingly, the men’s signals were not predictive, but somehow men must have been able to subconsciously pick up on the women’s signals, because in almost all cases the men didn’t ask for phone numbers where it wasn’t reciprocated by women. – They also found that honest signals predicted depression, predicted who was likely to be successful in negotiating for a pay raise, job interviews, who was bluffing at poker, etc. Successful individual-level traits: they found that the most successful folks with these “honest signals” were ones who were high in activity, high in influence (others were more likely to mirror their communication styles then they were likely to mirror others’) high in “variable prosody” (their pitch varied and they sounded open to ideas), and high in body language dominance (i.e., they were more likely to directly face another person and others were more likely to not face them square on). They were often far more successful in these “honest signals” than they were aware of. Sandy notes that unlike an MRI, one can hook up an entire organization to these sociometers and absorb micro-second by micro-second, and the results are highly predictive. But the challenge is that while the people who exhibit these highly successful individual traits are useful to organizations, they are usually in “connector” roles for organizations, with star-shaped patterns of communication, where ideas flow through these individuals. While this speeds up the decision-making process, it actually impairs the brainstorming process. Sandy’s group is experimenting with devices to see if making participants aware of the dynamics of a team can influence their behavior in a positive manner. They have shown with some experiments (Japanese-American teams designing Rube-Goldberg-type projects, and distance teams) that it can change people’s behaviors in a positive manner. The challenge will be to see if the group’s behavior can be more connected at the brainstorming phase and more “star-shaped” at the decision-making stage. –Traffic: one could monitor, for example, delivery vans coursing through the road networks and by observing flows slower than typical, spot emerging traffic problems. 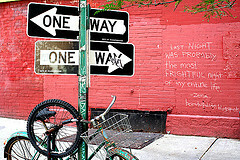 –Urban tribes: Sandy noted that by monitoring flows of taxis, you can distill separate patterns of interconnected places. In other words people who live in this neighborhood, work in this area, go to these restaurants, go to these nightclubs. (You are not actually monitoring individual people but patterns of association. This is equivalent to Netflix telling you that people who like “The Firm” also like “Michael Clayton”.) Or one can even find sub-patterns in a neighborhood:e.g., locations from which people regularly are returning from nightclubs at 3 or 4 AM. -You can then use these patterns to “find people like me”: based on your own patterns (where you work, where you live, etc. ), the system could tell you where many people in your neighborhood shop, go to dinner, or hear music. – Lending: one major bank told Sandy that credit scores are not very good (except at the high end) in predicting repayment rates on loans. Banks would love to use behavioral information (who is at nightclubs late at night, who goes to work early) to predict repayment rates. – Germs: they want to use these devices to watch the spread of germs through social networks. The above examples of health insurance and lending make one understand why there are clear privacy implications. Do we want banks or health insurers knowing what we are doing (going to nightclubs) to set our rates? Will this be used to impose behavioral bases for “red lining”, where people in certain areas (like the old red lined areas) don’t get loans because of some behavior of theirs that is correlated with low repayment rates? Does it make any difference if these people can supposedly change their behavior? -Sandy thinks we should move from company owning the personal data and sharing with no one or only sharing if an individual didn’t say it was confidential to the person owning the data and being able to decide how it gets used and whether the owner gets compensated for such use. -There are clearly issues here about how the decision is framed? Does the individual truly understand why certain marginal information is so useful to a bank or insurer? And there may be negative externalities for all, even if you don’t choose to share your information with these companies? Sandy’s research also raises questions about what happens when you start incentivizing people in companies based on these behaviors, or you start teaching people about these hidden “honest signals”. Do people start learning how to display these honest signals and dupe people who are not as aware of this (e.g., mimicking others to increase sales or do better in negotiations). If so, do people start focusing on these behaviors (like mimicry) and consciously teach themselves not to be swayed by this? Do companies find that people who pretend to be connectors (to get a pay raise) are actually less valuable to companies than the people who do it naturally (and are unaware they are doing this)? See previews of Sandy’s book Honest Signals here. Buy Alex (Sandy) Pentland’s Honest Signals here. See interesting related story in NYT, “You’re Leaving a Digital Trail. Should You Care?” (John Markoff, 11/30/08), mentioning Alex Pentland’s work among others and discussing the SF taxi example. “The easy answer is the obvious one: crowdsourcing (see also description later in post). The action of a few million hyperconnected individuals resulted in a massive and massively influential work: Wikipedia. But the examples only begin there. They range much further afield. “Uni [University] students have been sharing their unvarnished assessments of their instructors and lecturers. Ratemyprofessors.com has become the bête noire of the academy, because researchers who can’t teach find they have no one signing up for their courses, while the best lecturers, with the highest ratings, suddenly find themselves swarmed with offers for better teaching positions at more prestigious universities. A simply and easily implemented system of crowdsourced reviews has carefully undone all of the work of the tenure boards of the academy. “It won’t be long until everything else follows. Restaurant reviews – that’s done. What about reviews of doctors? Lawyers? Indian chiefs? Politicans? ISPs? (Oh, wait, we have that with Whirlpool.) Anything you can think of. Anything you might need. All of it will have been so extensively reviewed by such a large mob that you will know nearly everything that can be known before you sign on that dotted line. He suggests that these e-connections and contributions can in effect tell us which restaurant can be trusted to eat at, which professor we can entrust to teach us a class. In principle, one could use this to also pass on social reputation with pictures and names for community residents who had behaved in an untrustworthy manner so others could avoid them. On its face it sounds like a persuasive argument and part of a strand that suggests that the new technology can always out-do what we used to do. Assuming the software is effective at eliminating shills (as eBay or Amazon had to contend with — writers or sellers getting fake users or affiliated users from giving them great reviews), these kind of crowdsourcing techniques can be helpful. Yelp‘s recommendations about restaurants are often good; and Amazon‘s recommendations are instructive. What can’t these invisible, helping e-networks do? 1) get at the truth with contested theories of what happened; 2) tell you whether you should value A’s comments more than B’s (although in principle the software could rate the comments by friends in common or their reputation); 3) actually be useful for things beyond spreading information (trust, reciprocity, social support, etc.). Pesce goes on to point out that the technology does have limits. Technology brings us together in anarcho-syndicalism and offers the potential for community. But what limits its effectiveness is that we have a collision between the e-crowd and community and community requires us to work together. We want to copy and mimic what others have done, but that requires each of us to act for the good of others. “But [our] laziness, it’s built into our culture. Socially, we have two states of being: community and crowd. A community can collaborate to bring a new mobile carrier into being. A crowd can only gripe about their carrier. And now, as the strict lines between community and crowd get increasingly confused because of the upswing in hyperconnectivity, we behave like crowds when we really ought to be organizing like a community. And this…is..the message I really want to leave you with. You … are the masters of the world. Not your bosses, not your shareholders, not your users. You. You folks, right here and right now. The keys to the kingdom of hyperconnectivity have been given to you. You can contour, shape and control that chaotic meeting point between community and crowd. That is what you do every time you craft an interface, or write a script. Your work helps people self-organize. Your work can engage us at our laziest, and turn us into happy worker bees. It can be done. Wikipedia has shown the way. What Pesce doesn’t discuss is “social capital.” This seems to be missing from his remarks. Some of us may serve others in real space or electronically through the goodnesss of our hearts. We’re do-gooders or e-do.gooders. But others of us need to understand that these social ties hold us accountable to the group. They make us more likely to do things for others because we are hardwired to provide more for people inside our circles than outside our circles. That’s why we give more to our family than to strangers and help friends more than we do a tribe half-way around the world. Social ties redefine our sense of ‘we’. It’s hard to believe that exhortations to do good on the Internet, as important as they are, will achieve the optimal amount of communal action. That is, after all, why commons are overgrazed and oceans are overfished. Because too many in society realize that there is more to be had from overgrazing and overfishing now rather than letting someone else do it. Social capital can also help police social norms (of working for others, of contributing, of not taking more than one’s share). Experimental evidence shows that fairness also seems hardwired into our brains. We are willing to punish others in experimental Ultimatum or Dictator Games from behaving in a selfish manner, even when it means that we the punisher gets less. For more on Crowdsourcing, Jeff Howe (from Wired) has an interesting new book, Crowdsourcing: Why the Power of the Crowd is Driving the Future of Business (2008). Definition: A company outsourcing a job traditionally served by employees and fills it through an open call to large undefined group of people, generally using on the internet. People best qualified to do the job are not always the person that one would first think of to assign a job in a corporation. CrowdSourcing builds upon The Wisdom of Crowds; in it, Howe identifies 4 ways in which groups can produce better results than individuals: collective intelligence, crowd creation, crowd voting, and crowd funding. Note: Nobelist Danny Kahneman suggests that the real value of the wisdom of crowd is only when the error of people’s guesses or predictions are uncorrelated and this most likely to happen when we talk to others who disagree with us or are unlike us. From BusinessWeek’s review of the “Widsom of Crowds” book: “In the first [category], collective intelligence, companies including Dell and gold-mining group Goldcorp ask people inside and outside the company to help solve problems and suggest new products, such as Dell‘s Linux-based computers. The second model, crowd creation, is used by businesses such as Current TV and Frito-Lay to create news segments and video ads. People vote for their favorite T-shirt design at apparel maker Threadless’ Web site, thereby illustrating crowd voting. Startups SellaBand and Kiva use the last model, crowdfunding, to underwrite new music labels and fund microloans to individuals. “Howe’s best example is iStockphoto, a startup that is undermining the established stock-photo business. The community began in 2000 as a vehicle for hobbyists who wanted to trade their pics. Two years later, iStock began selling photos for 25 cents each to cover bandwidth costs. Clients flocked in, and in 2006, Getty Images bought the enterprise. Now, with 60,000 part-time photographers and illustrators on board, 3.5 million images in the bank, and 2 million customers, iStock is the world’s third-largest dealer of images. While Howe praises this rise of the ‘virtual crowd’ — you used to have to actually assemble a crowd to benefit and now gee-whiz you can do it on the internet — I wonder whether despite benefits to corporations or individuals (like cheaper pictures on iStockPhoto or better predictions of what ads will work), we’ve lost the social capital inherent in actual crowds or the social capital built from these old-line processes. If we are migrating to more CrowdSourcing we ought at least pursue what we do (at a minimum via the Internet) to actually bring this virtual crowd together (making creating e-events, maybe creating communities of interest as was the genesis of iStockPhoto, maybe if the virtual crowd is large enough, breaking it down by zip code and encouraging and facilitating pieces of the crowd getting together in real space). What’s good for the goose is not always so for the gander, and CrowdSourcing is likely to lead to cheaper outcomes (for example photos) and often better, more democratic decisions, it portends to exacerbate the real losses we’ve seen in our true communities over the last generation. “[T]hey [the new middle class] will suffer a drop in social capital. In times of recession, people spend more time at home. But this will be the first steep recession since the revolution in household formation. Nesting amongst an extended family rich in social capital is very different from nesting in a one-person household that is isolated from family and community bonds. People in the lower middle class have much higher divorce rates and many fewer community ties. For them, cocooning is more likely to be a perilous psychological spiral. I agree with David Brooks’ first fear. That said, since social networks have always been the backbone of social movements (from abolition to civil rights to women’s suffrage) it’s hard to fathom how this isolated ex-middle class constituency is going to build a movement out of vaporware. But with time on their hand, and the Internet at their disposal, maybe this will be the test of whether Internet tools (from Meetup to Facebook to virally circulated YouTube recruiting efforts) can be put to use to engage these displaced Americans and give collective voice to their frustrations. No Virginia, there isn’t a God? 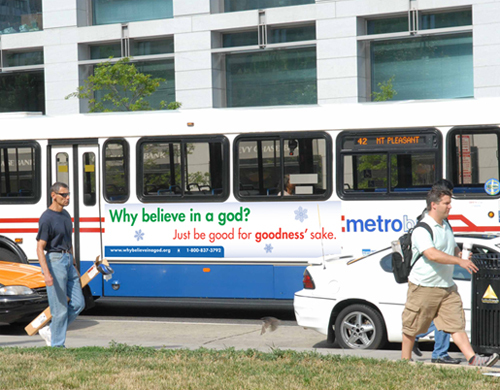 An atheist organization (The American Humanist Association) has adapted the British Humanist Association’s UK campaign (“There’s probably No God – Now stop worrying and enjoy your life “) to the US starting in DC with a Christmas season ad campaign to try to convince more Americans not to believe in God and to be good anyway, (“Why Believe In God? Just Be Good For Goodness Sake”). Unfortunately, their campaign flies in the face of strong data-based evidence in the US, from a high quality, large scale survey, of how religious citizens (controlling for lots of other individual factors) are better citizens: they give more to secular causes, volunteer more for secular causes, vote more, are more engaged in their communities, to name only a few benefits. That said, the survey did not find that it is belief that produces this benefits, it was having friends in a faith community, probably because it was something about being surrounded by others who were infused with moral beliefs that held them accountable for their actions. The survey findings reveal that “belief in God” is not the crucial predictor; atheists in theory can be nice and happy if go to church and make friends there (although only 4% of those attending church monthly are “not quite sure” they believe in God), and conversely, believers who don’t go to “church” or don’t have any friends there are more likely to be mean and unhappy. The survey reveals that 21% of those who are “absolutely sure” about God attend church no more than once or twice a year. This and other evidence of how religion and public life intersect will come out late next year in a book, tentatively entitled “American Grace” (Simon & Schuster) by my colleague Robert Putnam, and professor David Campbell at Notre Dame.